This past weekend was a blur! On Friday, the husband and I (I like saying that 🙂 ) flew into Evansville, IN for a wedding. By Sunday at 6:30 we were home. Well, home after a brief stint of searching for the car on 4 different levels of the parking garage. I actually like flying, airports fascinate me. They are these strange little timeless worlds where everyone has a defined purpose and seeing someone bellying up to the bar at 8:00 a.m. is actually not an unusual sight. After settling in and watching a little golf we were hungry and definitely did not want another meal out so I whipped up my quick mariana sauce, it is the perfect mix of fresh, tangy tomato, spicy garlic and basil. Better yet: it all comes together in under 30 minutes. Pour a little olive oil in a pan and add the garlic and hot pepper flakes. Let this sit to infuse while you prepare the other ingredients. Heat the pan to a medium heat and add onion. Sauté until translucent. 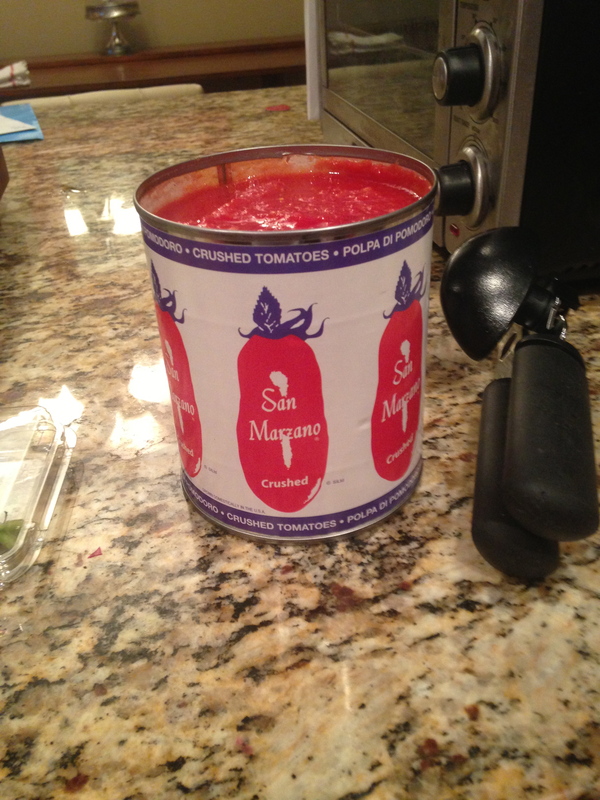 Pour in the can of tomatoes, herbs and the bay leaf. Season with salt and pepper to taste. Let simmer on a low heat for 15-20 minutes while you prepare pasta. Once pasta is cooked and drained, dump it in with the sauce and cook it together for a few minutes.